At COP21, India pledged to draw 40% its power from renewables by 2030. What is the govt doing to achieve it? Strongly voicing India's commitment to clean energy at the Paris Climate change summit, Prime Minister Narendra Modi pledged to draw 40 per cent of the country's electricity from renewables by 2030. This also reflected upon India's willingness to divert from fossil fuel dependency. But much before the climate change summit, India had already geared up towards achieving its ambitious energy goals under the leadership of PM Modi. As the chief minister of Gujarat, Modi unearthed the hidden potential of the state, thus making it the pioneer of solar energy production in India with 1,000MW of production currently. Now, he is aiming for a same feat at the national level. 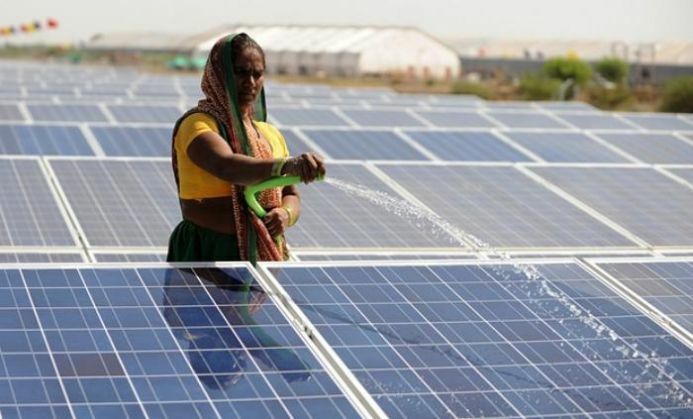 Strengthening its stance on boosting solar energy, in June 2015, the Union Cabinet approved a plan to increase India's solar power capacity target five-fold to 1,00,000 megawatts by 2022. This is equivalent to roughly one-third of the country's current total electricity generation capacity. Rooftop installations include a 40 per cent chunk of this target and the remainder will come from medium and large grid-connected projects. The government is planning for hybrid energy parks in areas with abundant sun radiation. The cost of electricity from solar photo-voltaic cells is coming down drastically and according to the government, it is expected to come down further in the face of massive R&D work going on across the world. The Indian Railways is looking to run its locomotives on solar power and installing panels across station platforms. The Delhi Metro Railway Corporation is on track to go completely solar -- talks are on to supply it with 2,000 MW of solar power through the central transmission network. On a larger scale, 27 'solar cities' have been identified for reducing the consumption of conventional energy by a minimum of 10 per cent in five years by opting for power from renewable sources and adopting efficiency measures. The government has permitted 100 per cent foreign investment and is offering a series of tax breaks for the fledgling sector. 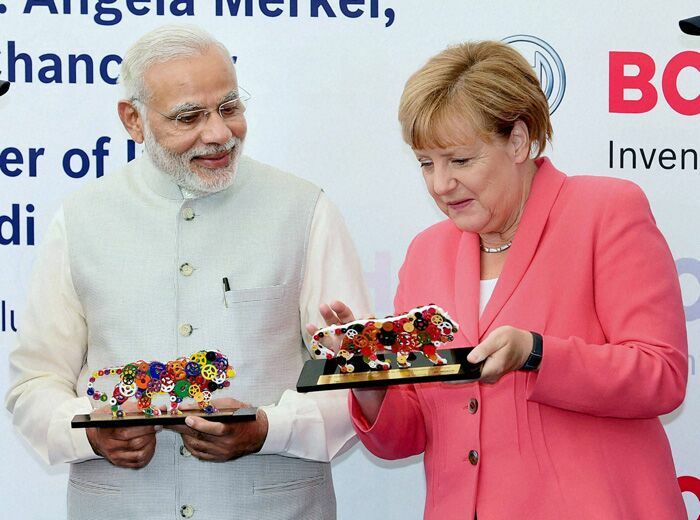 A 1 billion euros solar power fund by Germany was a major gainer in this regard. Echoing India's commitment to solar power, Modi also launched an international solar alliance of over 120 countries with the French president, Francois Hollande, at the Paris COP21 climate summit. The signatory nations mostly hail from the tropics and include several European countries which will work for research and development on the solar energy sector. 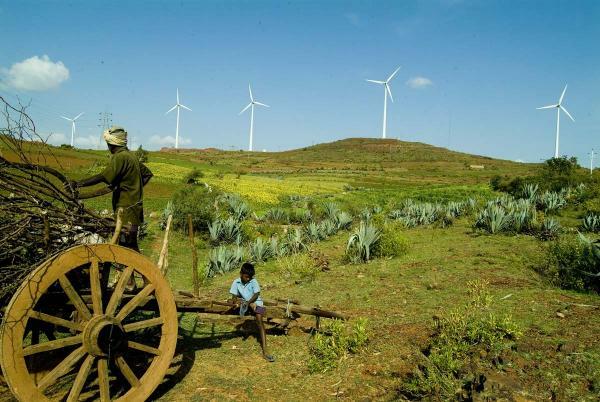 The government has also set a target of generating 60,000MW in wind power capacity by 2022. The sector also got a big boost as the government has restored key tax incentives. According to Indian Wind Turbine Manufacturers Association (IWTMA), proposed target is achievable as the country has the capacity to manufacture close to 9,500 MW of wind turbines and it can be expanded in a short period. The government has also planned to provide support to the turbine manufacturers under Make in India to counter international competitors like China. Ministry of new and renewable energy and Indian Renewable Energy Development Agency are reportedly jointly planning to host an international meet in February next year to give impetus to the wind power sector. 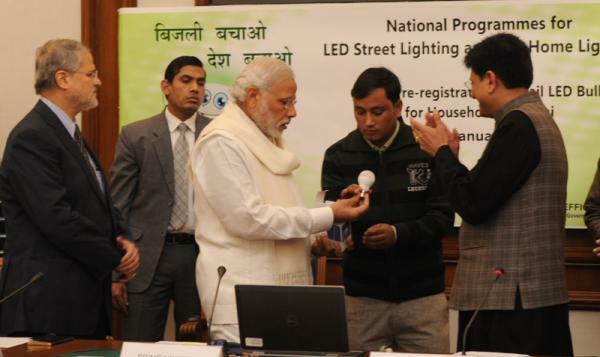 In a path breaking step, the Modi government in January 2015, launched the National Programme for LED-based Home and Street Lighting - sought to increase India's usage of LED (light emitting diode) lamps across homes and cities. The goal was to replace conventional lamps, which typically use more power. Budget allocated for the initiative was Rs 2,500 crore and the idea was to switch all the street lamps across 100 cities to LED by May 2016. According to media reports, the initiative is bearing results. The production of LED lamps in India has increased 30 times to 30 million units per month compared to last year. These lamps can save 100 billion KwH of electricity annually if they replace some 770 million conventional bulbs that India purchases annually. With increased production of LED lamps over the past year, the per unit cost has also been brought down significantly. There is also a beneficial financing scheme where the consumer can purchase the bulb for a certain amount and the rest of it will deducted from his electricity bill. TWEET THIS Turn to the sun: here is how Modi govt trying to drive the nation towards clean energy At COP21, India pledged to draw 40% its power from renewables by 2030. What is the govt doing to achieve it?